Azalea is the common name for various flowering shrubs within the plant genus Rhododendron, characterized by the lack of scales on the underside of the generally thin, soft, and pointed leaves, and typically having terminal blooms (one flower per stem), flowers with five or six stamens, and with long straight hairs parallel to the leaf surface and along the midrid on the ventral surface of the leaf. Originally, azaleas were classed as a different genus of plant, but now they are recognized as two of the subgenera of rhododendrons: subgenus Pentanthera (deciduous), and subgenus Titsushi (evergreen). Azaleas are very popular ornamental plants and among the most popular garden plants. Their showy flowers are prized for their beauty and the leaves of evergreen species add a deep green color to a garden while the leaves of deciduous azaleas offer a bright color in the fall before they fall. Some are used in producing food and drink (Lee 2001). Azaleas belong to the Rhododendron genus of the flowering plant family Ericaceae. Ericaceae (also called the heath family or ericaceous plants) are mostly lime-hating or calcifuge plants that thrive in acid soils. The family Ericaceae includes numerous plants from mostly temperate climates. In addition to rhododendrons, well-known examples include cranberry, blueberry, heath, heather, and huckleberry. The Ericaceae family consists of herbs, shrubs, and trees with leaves that are alternate, simple, and estipulate. Rhododendron is a large genus with over 1,000 species and most have showy flower displays. The genus is shrubs and small to (rarely) large trees, the smallest species growing to 10-20 centimeters tall, and the largest, R. arboreum, reported to 50 meters tall. The leaves are spirally arranged; leaf size can range from 1-2 centimeters to over 50 centimeters, or in exceptional cases 100 centimeters in R. sinogrande. They may be either evergreen or deciduous. In some species the underside of the leaves are covered with scales (lepidote) or hairs (indumentum). Some of the best known species are noted for their many clusters of large flowers. There are alpine species with small flowers and small leaves, and tropical species such as subgenus Vireya that often grow as epiphytes. Subgenus Rhododendron L.: small leaf or lepidotes (with scales on the underside of their leaves); several hundred species, type: Rhododendron ferrugineum. The tropical rhododendrons (sect. Vireya, about 300 species) are usually included as a section in this subgenus, but sometimes split off as a ninth subgenus. 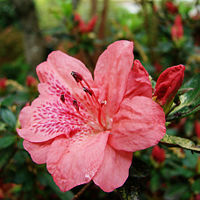 Two of the subgenera are known as azaleas: Pentanthera (deciduous azaleas) and Tsutsusi (evergreen azaleas). Azaleas at one point were placed in their own genus, Azalea, but the differences between azaleas and the other members of Rhododendron are not considered to be great enough to justify their separation into distinct genera. Azaleas are typically characterized by showy flowers, having clusters of variously colored flowers: pink, red, yellow, orange, purple, and white. Many are distinct from other members of Rhododendron by having deciduous leaves, but some (the 15 species in subgenera Tsutsusi) are also evergreen. A major difference between azaleas and the other members of the Rhododendron genus is their flower growth; rhododendrons grow their flowers in stripers, while most azaleas have terminal blooms (one flower per flower stem). However, they have so many stems that during the flowering season they are a solid mass of color. Azaleas are recognized by these flowers blooming all at once, in a showy display for a month or two in spring. The exception to this rule is a small group of azaleas that grow their flowers in tight terminal clusters. Azalea flower are often funnel shaped and fragrant. Most azaleas have flowers with only five or six stamens, while other members of Rhododendron have ten stamens (ASZ 2007). Azalea leaves tend to be thinner, softer, and more pointed than other members of the Rhododendron genus, and azalea leaves tend to have long straight hairs that are parallel to the leaf surface and usually along the midrib on the underside of the leaf (ASZ 2007). Other members of Rhododendron tend to have larger and more leathery leaves (Starbuck 2007). Another difference on the leaves is that azaleas never have scales (tiny round structures) on the underside of the leaf, but small-leaved rhododendrons have leaves that are always covered with scales (ASZ 2007). Small-leaf rhododendrons, subgenus Rhododendron, are known as "lepidote" rhododendrons, where lepidote means "covered with scales." (ASZ 2007). 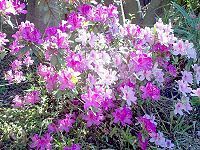 Azaleas grow best in well-drained soil or in plant pots in a cool, shady position. Fertilizer is optional, although some species do need regular pruning. 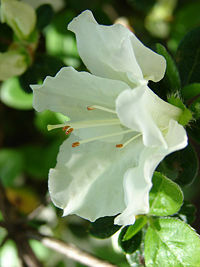 Popular varieties of azaleas in the United States include R. arborescens (sweet or smooth azalea), R. calendulacea (flame azalea), R. nudiflora or R. periclymenoides (pinxter flower), R. occidentalis (western azaliea), R. viscosa (swamp honeysuckle or fragrant white azalea), and R. canadense. The Ghent azaleas are hybrids. The Satsuki azalea group, derived from Rhododendron indicum and related species, are also very popular. Several commercial nurseries in Semmes, Alabama, a suburb of Mobile, are major national suppliers of azaleas in the United States. A traditional alcoholic beverage made from azalea blossoms, called dugyeonju (두견주, literally "azalea wine"), is produced in Korea as well as azalea cakes where flowers are kneaded into a dough of rice flour. (Lee 2001). Many cities in the United States have festivals in the spring celebrating the blooms of the azalea. Motoyama, Kochi, Japan also has a flower festival in which the blooming of Tsutsusi is celebrated. 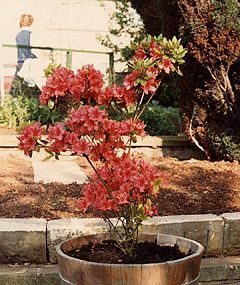 Azalea Society of America (ASA). 2007. Azaleas. Azalea Society of America. Retrieved December 12, 2007. Lee, K.-H. 2001. Azalea blossoms: palate-pleasing inspiration of poets. Sky News 2(28). Retrieved December 12, 2007. Starbuck, C. J. 2007. Growing Azaleas and Rhododendrons. University of Missouri Extension. Retrieved December 13, 2007. This page was last modified on 18 December 2008, at 03:46.